Hall Creek Road [(B)(5.1)(a)] as revised and updated. Please refer to the Elk Mountain posting for more details. This climb is part of a ridge traverse from (and back to) Elk Mountain. Consequently, the route discussion begins at the lowest saddle between Peak 10153 and Elk Mountain. Date of Climb: 8/11/17. This route begins at the 9,820-foot saddle that lies at the base of the Southeast Ridge of Peak 10153. Leave the CDT here as it does NOT go to the summit of Peak 10153. From the saddle, scramble up easy scree slopes to reach the flat talus-and-tundra summit area of Peak 10153. There is a large cairn with a pipe in it on the summit. The “Southeast Ridge” is more of a face climb than a ridge climb since the ridge is rather ill-defined. I later descended this route to return to Elk Mountain and the Frank Hall Creek Road. 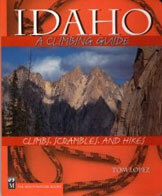 Please note that the book incorrectly states that the CDT goes to the summit of Peak 10153. In fact, the CDT skirts the south side of the peak at approximately 150 vertical feet below the summit. This route is part of a ridge traverse to, and then from, Peak 10025/Dad Creek Peak on the Montana side of the Continental Divide. Consequently, I will describe it as a descent route that begins on the summit of Peak 10153. Descend northeast down the somewhat ill-defined Northeast Ridge on loose, steep talus and scree. Thankfully, you will find a good climber’s trail soon after you begin the descent. The climber’s trail flames out well before reaching the gentle 9,700-foot saddle below, but it sure helps in the upper half of this ridge scramble.